Some days, you just want to find a way to have take-out without the take-out prices and “nutritionals”. (I put “nutritionals” in quotes mostly because the salt, fat and calories from take-out food can just be astronomical, and eating in is a really good way to control all of that.) I was trying to find a way to get a simple “one-off” dinner, and I’ve made sweet and sour chicken in the crock pot, so I thought I’d make some sweet and sour pork for a slight change of pace. I had a recipe for a skillet-based sweet and sour that required a number of ingredients (ketchup, pineapple juice, etc.) – and one of the ingredients was CORN SYRUP. Hrm. Not so sure I like that idea. Believe it or not, the La Choy Sweet and Sour Sauce has no corn syrup of any kind in it in it. The sodium was also fairly low, so I figured that this was one of those times where reaching for the bottle was not only convenient but also more in line with what I’d rather have filling the crock. We put this over rice, but it goes just as nicely over soba noodles, if you want a different accompaniment. And, if you’d prefer this in chicken form – no worries: substitute boneless skinless chicken breasts for the boneless pork sirloin chops and you’re good to go! 1. Coat inside of crock with nonstick cooking spray. 2. Cut pork into 1″ cubes; place in crock. 3. Add the sweet and sour sauce, water chestnuts, bamboo shoots and water to the crock. Stir well to combine. 5. 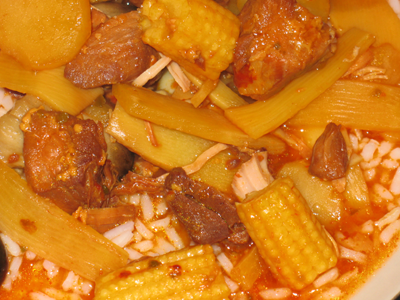 When done cooking, add the drained mushrooms and baby corn to the crock and stir to combine. Cover and cook on HIGH for 15 minutes, then serve over rice or soba noodles. This entry was posted in crock pot cooking, entrees and tagged chicken, cooking, crock pot, crockpot, pork by crunchymetromom. Bookmark the permalink.